Make use of convenient amenities such as complimentary wireless Internet access, concierge services, and a television in a common area. If you're planning a day at a nearby theme park, you can hop on the shuttle (surcharge). At Hotel Vienna Touring, enjoy a satisfying meal at the restaurant. Wrap up your day with a drink at the bar/lounge. A complimentary buffet breakfast is served daily from 7:30 AM to 10 AM. With a stay at Hotel Boemia, you'll be centrally located in Riccione, within a 10-minute drive of Rimini Beach and Aquafan. 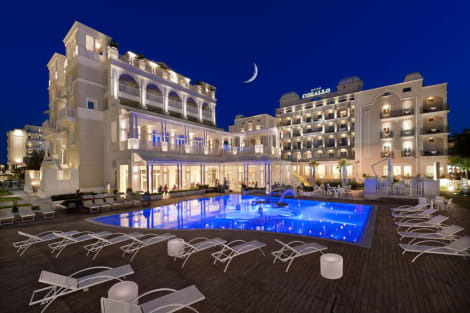 This 4-star hotel is 4.4 mi (7.1 km) from Misano World Circuit Marco Simoncelli and 12.4 mi (19.9 km) from Rimini Fiera Expo Center. Enjoy a meal at Il Corallino 4 Stagioni or snacks in the coffee shop/café. The hotel also offers room service (during limited hours). Meet other guests and eat at the complimentary reception. Unwind at the end of the day with a drink at the bar/lounge or the poolside bar. A complimentary hot/cold buffet breakfast is served daily from 7:30 AM to 10:30 AM.